After Our Lord’s death on the cross a soldier pierced His side with a sword. Blood and water poured forth from this wound. When the priest prepares the chalice for consecration he pours in wine and water. We ask why Blood and water and why wine and water? St. Ambrose tells us that water came forth from Christ’s side so that we might be cleansed and Blood so that we might be redeemed. Water is also used in the sacrament of Baptism to symbolize the cleansing of the soul that takes place in this sacrament. It is not enough to have just the water (cleansing) we must also have the Blood (redemption) – the price of our sins must be paid. The priest puts water into the chalice for this same reason – symbolizing the cleansing of our sins united with our redemption in Christ’s Blood. Let us recall the Blood and water from Christ’s side and the wine and water in the chalice and remind ourselves to cleanse ourselves in the water of Baptism and in the sacrament of Penance. As we are also symbolized in the water we are likewise united forever with Christ in the Holy Eucharist. We know that this is the same Christ worshiped and adored in Heaven by the angels and saints. As we fear nothing as much as the demons from Hell, may we always remember that it is worse to receive Holy Communion unworthily than it is to be possessed by devils. The 'Sunday after Pentecost' cycle again gives way this weekend as the 24th June is the feast of the Nativity of St. John the Baptist and this liturgically is a higher ranking feast (Class I) than what would be the IV Sunday After Pentecost (Class II) although it is commemorated. In the past the feast day had a higher importance than today and was celebrated similar to Christmas with each priest having authorization to say 3 Masses. This Sunday, let us pray for St. John’s intercession to increase the number of holy priests to convert the pagan world to Christ and announce Him to unbelievers! 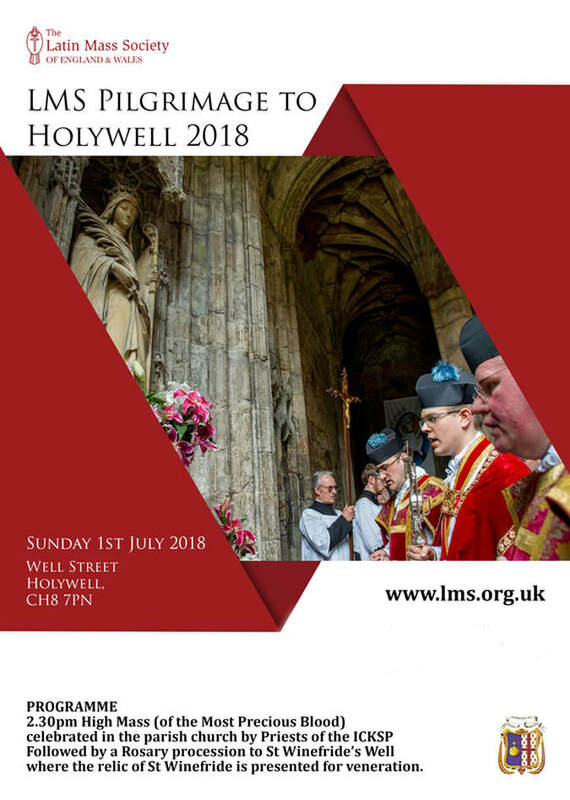 Mass in the Extraordinary Form of the Roman Rite will be offered at Holywell Parish Church (St Winefride's), Well Street, Holywell at 11.30am on Sunday. The multitude were following Jesus and pressing upon Him, because they desired health for their bodies. Jesus, desired to help them, but He desired to give them greater gifts than they were seeking. They wanted physical goods, and Jesus wished to give them spiritual riches. It is necessary that God create a distance between Himself and us before He can give us what we truly need. Very often in this world, we mistake what we want with what we need. We think (or imagine) that we need all the things of this world that bring us pleasure. These are not real needs. We see many in the world living without the things that we think we need. The commercial interests of our society have mastered the advertising industry to the point of convincing many that they have a real need for their products. These are not true needs, but rather imaginary needs, or actually nothing more than wishes or desires. The things we wish or desire are very often not the best things for us. These things often bring temporary pleasure, but then, fill us with pain and suffering. Having created the misery, the commercial industry is quick to offer us another solution to our misery with another product that, likewise, only offers a temporary pleasure rather than, a real happiness. Just as Jesus pulled away from the crowd to be able to speak to them, so very often God pulls away from us so that we can hear Him once again. When He is near us we are very busy telling Him about our material wants and needs, and we give little attention to our immortal souls. We desire and pursue fleeting pleasures, and forget to look for lasting happiness. Jesus got into the boat of Peter and pulled away from the crowd to create a barrier between Himself and the people with the water. To get near to Jesus one would have to board Peter's boat. Today, if we are desirous of drawing near to Jesus, we must enter the bark of Peter — the Catholic Church. From the Church, God does dispense many material goods to His faithful, but the chief gifts that He dispenses are the goods of the soul — grace — through the Sacraments. God is always near us by His omnipresence and this gives us joy, and a desire to not let this joy slip through our fingers. But, this joy is an obstacle to our true happiness. Hence, we are admonished to deny ourselves and take up our daily crosses. In denying ourselves the temporary joys of this world, we open up the lines of communication from God. The communication of material things is generally only our prayers to God. We fill His ear with our wants and "needs" because God is good He often answers those prayers and gives us the things we seek. However, we seldom know what is really good for us, and what we are seeking are not the true graces that God so lovingly and eagerly desires to shower upon us. We need to silence the cries of our flesh, and begin seeking to know and follow God's Will. It is not what we want that is important; the only thing that is important is God's Will. We learn God's Will for us after we are physically distanced from Him, and silence the cries of our bodies. Then He will speak to us and we will learn from Him what He wants from us. We have wasted too much time telling God what we want from Him, when He already knows this. What is needed is for us to listen to what He wants from us. In the Catholic Church, we find a sanctuary. This sanctuary puts a barrier between God and the people, just as the boat of Peter but a barrier between Jesus and the multitude. We are not permitted to rush forward and press upon Our Lord in the Blessed Sacrament, but must remain a short distance away, and listen to His Word in the Gospel, the Epistles, the sermons, etc. Once we have given our attention to Jesus and heard His words, we are inspired with what God desires from us. Then, after this, He invites us not to just approach Him, but to even receive Him into our bodies. He approaches to the edge of the sanctuary, and we approach from our side — meeting at the Communion rail, where He gives us the greatest good of all — Himself. How truly sad it is that so few come to hear the Word of God, and even fewer come to receive Him in the Holy Eucharist. St. Peter, instructed by Jesus, let out his nets and drew in a great multitude of fishes; the Church has let our her nets and has drawn in a great multitude of souls. While there were many that were drawn in, there were many more that were not. It should be our greatest desire to be among those drawn into the bark of Peter; for, only in his boat was Jesus to be found. In the same way, it is only in the Catholic Church that the true Jesus is to be found. It is only in Her that we can hear Jesus speak to us and receive Him. St Francis of Assisi Church, Llay at 12.30pm on Sunday 10th June. What man of you having a hundred sheep, and losing one of them, does not leave the ninety-nine in the desert, and go after that which is lost, until he finds it? The fall of mankind through the sin of Adam represents to us the one sheep that was lost, and the one coin that was lost. The ninety-nine sheep and the nine coins remaining represent to us the faithful angels in Heaven. Ten is a complete number as well as one-hundred. Heaven is not complete without mankind. It is for this reason that God came to this earth to find and restore fallen mankind. We are what God is seeking, yet God has never lost sight of us. We are always in His presence — even when we turn away from Him. What we are to understand by God seeking us, is that He is desirous of turning us back to Himself. There is imprinted upon us the image and likeness of God, just as there is the image and likeness of the ruler upon our coins. The woman turns her house upside down to find that lost coin. St. Gregory instructs us that the coin (or image of God) is still within us (our house). The image of God is hidden or covered with dirt or dust of our sins. We need not go out of ourselves to find Him. He is there within us. We do need to turn our house upside down to see Him once more. We must make a thorough house-cleaning. We need to examine our consciences and do penance and in this manner the image of God is restored within us. The coin is returned to its rightful place. This analogy of St. Gregory suggests to us that we must be ever cautious concerning our spiritual life. God's omnipresence is a doctrine that does not seem to be fully appreciated in our days. God is everywhere, even within us. Or, as St. Augustine tells us, we do not find God within us as much as we find ourselves in God. It is similar to the fact that there is air within us; but it is more properly said that we find ourselves in the air that we breathe, rather than find the air that we breathe within ourselves. When we sin, God is not only there to observe the disorder and crimes that we commit, but He is even present within us. He is in a manner made a hostage or prisoner within us forced to watch silently as we take advantage of Him and abuse His goodness. We heap dirt and filth upon Him by our sins. In this manner He is lost to us; or more appropriately we are lost to Him. For it is more appropriate to hold that we belong to God, rather than that He belongs to us. Christ is, therefore, the Good Shepherd that has come to find the lost sheep and restore us to His Heavenly Flock; and He is the Woman who turns the house upside down in cleaning it to restore His beautiful Image within our souls. What is necessary for us, is to stop hindering His efforts, and allow His grace to transform us. We must first acknowledge that we are sinners, as did all those who in today's Gospel came to hear Him. We are all sinners and are all in need of His saving help. The Pharisees were perhaps in the greatest need of Him even though they considered themselves to be just. With this in mind, we should always be wary of growing lax in our spiritual pursuit of purification. God begins, this turning of our souls upside down by gradually revealing to us our sins. He shows us little by little the dust, then the dirt, then the filth in our souls. He inspires us first to do a little dusting. If we cooperate with Him, He will show us that we need to do a little more than dust, we must break out the broom. If we cooperate in this, He will then show us that dusting and sweeping aren't nearly enough; we need to bring out the scrub bucket with lots of soap and water. We suggest that God does this gradually because if He showed us just how bad we truly are we would fall into despair. To prevent this despair, we have the parable of the lost sheep. When the shepherd has found the lost sheep, he does not force the sheep to walk or do anything. The Good Shepherd picks up the sheep and puts him upon his own shoulders and carries him back to the flock. All that is truly necessary on our own part, is to allow God to work His grace within us. We must stop running from Him. We must stop fearing the punishment He will inflict upon us. Christ would have us understand His great love for us. He desires only that which is good for us. He knows best what we need; and He will only ask of us that which He, Himself, will give to us. The penances and mortifications that our sins require of us; will be made possible by His grace. He will give us all that we need to do. It is truly as St. Paul tells us: "I can do all things in Him Who strengthens me." And, all things are made possible to those who love God. Let us allow ourselves to be cleaned and found and put back into right order so that God's image can once again be clearly visible within us. Then allow ourselves to be carried through our necessary penances and mortifications as He returns us to His Heavenly fold. The Gospel today presents us with a parable for the edification of the Pharisees with whom Christ was invited to eat. On this occasion Our Lord sought to instruct them concerning the Kingdom of God. It should not be much of a difficulty for us to comprehend this parable. Christ is the man that made a great supper and sent out his servants to call in all those that were invited. The Apostles are His servants. The tribes of Israel were those that were invited and refused to come. The Gentiles (other nations) are those who have been called in to take the place of those who were invited but would not come. The great supper itself is the Church or the Kingdom of God. These Pharisees were invited into the Church first. They even had in their possession the written invitation contained in the Sacred Scriptures. Christ Himself came and personally invited them, and He sent His Apostles and they refused them also. So then much to the shame and embarrassment of the Pharisees they who were first invited were now barred from entering: "none of those men that were invited shall taste of my supper". They became too filled with their own pride and vanity. They began to love the world in which they lived more than the heavenly world which was spoken of in the Sacred Texts. They possessed these Sacred Texts, read them and preached upon them, but apparently were not as interested in them as they wished to appear. They found more joy in appearing to be holy than in actually being holy. They wished to appear learned rather than believe what they themselves were saying. They therefore easily fell to snares of this mortal body. They gave in to the concupiscence of the flesh, and the concupiscence of the eyes, and the pride of life. These became more important and even all important to them rather than seeking the Kingdom of God. They were unable to "see the forest, for the trees". Too focused upon themselves they failed to see the bigger picture of God's eternal plan and the immortality of their own souls. The Pharisees blinded by their own passions failed to enter the Church even though they already had in their hands the invitation. They were replaced and the supper (heaven) was filled by others that were not given the prior invitation. St. Paul chastised himself and kept his body in subjection lest after having preached to others he himself might be lost. He saw clearly what had happened to the other Pharisees, and wished to make certain that he did not fall as they did. Today we witness history repeating itself. There are so many who have been born into the true Faith. They have been given the prior invitation _ the Faith and the Sacraments, but they have set them aside to pursue worldly pleasures: the concupiscence of the flesh and the concupiscence of the eyes and the pride of life. All most all those who glory in the name of Catholic or Christian have begun to make excuses, so others will be called in to take their place. What good is it if one has the Gospels and preaches upon them while he is filled with concupiscence and pride? God will reject the high and the mighty. He will lift up the humble and the weak. Those who have been given the Faith have the invitation, but if they set it aside to pursue the pleasures of this world and body, they will soon find that they have been excluded from the eternal feast in Heaven, and others who were much less than they, have been lifted up to take their place. Therefore, let us strive to keep ourselves faithful, humble, and obedient so that we will not be barred from heaven, but will find, in spite of our weakness and lowliness, a place has been made for us at the great supper in Heaven.